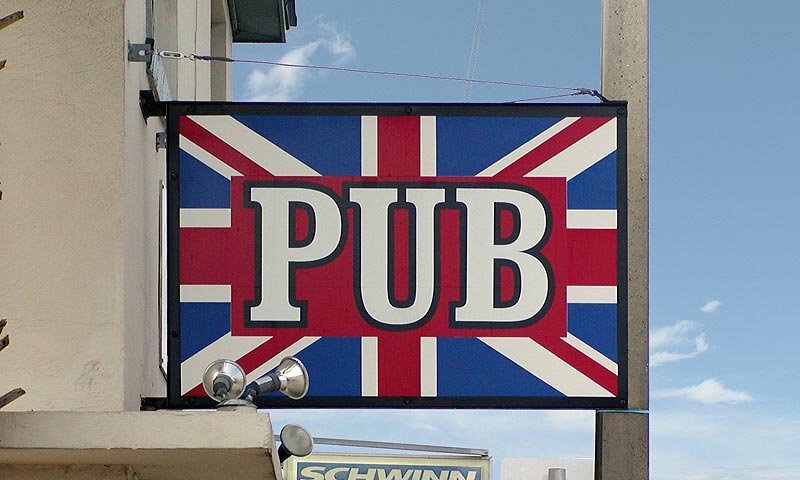 The British Pub is a great little sports bar, just over the Bridge of Lions on Anastasia Island. Owned by a British family, this pub has been serving great imported beers and food for years now. Come watch a game of football, soccer, or rugby on their big screen TV's, or grab a pint of beer and hang out with friends at the bar. Live music can be found at the British Pub every weekend, with special events throughout the week like Karaoke, open mic night, and trivia night. Check out local bands and DJ's at this great little bar and pub. Bottled beers: A wide selection of imported and most domestic bottled beers available. Spirits: White and red wines as well as Premium Blends spirits and cocktails. Pub Snacks: the British Pub is serving a variety of traditional English pasties, sausage rolls, Scotch eggs, Walker's crisps, imported sweets, and wings. Available all hours. The British Pub is located next to the Bike Shop on the island over the Bridge of Lions. August 2015. It seems that every time I have tried to revisit the British Pub it gets worse. Last time topped them all. 1st Buyer Beware! If the bartender isn't singing or taking care of friends u just might get a drink...you'll have to beg for it. When u pay, b sure to count your money and know your tab. The prices change ..a lot. And the bartender feels he's entitled to take his own tip! But if u want to Kareoke...Uh u might have to wait 2.5 hours and give up like I did. ******* PLACE. It's not a business, it's someone's home who is particular about the guest. Don't get trapped. The same songs with the same people day after day. They are the type of people that will nice to your face and then kick you curb if you aren't the one putting $$ in their pockets. If they had better talent to go with the light show it would be easier to deal with. Awesome place to have a nice time. Darts, karaoke, super clean and we'll decorated. Friendly employees and nice friendly environment.Cold beers. I can be here every weekend but we are from Tampa. Whoever is trying to run this place should get out of the business and do something they're more qualified for. I can't imagine what that would be though. They can't even clear their messages from voice mail. A kid with a lemonade stand operates with more professionalism. I was just there on Saturday, June 1, 2013 , there's more room in the pub now because they removed the pool table and some high table's and chairs, but there is still enough seating. The prices on drink's is the average price for a bar, not much different. They have a new Karaoke Stage on the opposite side of where it was at and it's way better then before and more screens, they have it on Thrusday, Friday and Saturday, starting around 9 PM to 9:30 PM and they will eventually have it all week long per the new upcoming Manager. Have lived in St Johns County over 2 yrs. and love St Augustine. This pub had a certain allure with the old ownership. Although slightly remodeled I was hoping for a lot more. Being a fellow Brit this place should be ashamed to call itself British. Beer too expensive and their dart boards where in horrible shape. Not for me.